"Shillingford, a pretty rural and thoroughly home-like looking village, is situated but a little below the famous junction, celebrated by several poets, of the Thames and the Isis. 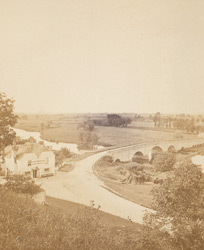 The considerable extension of the bridge beyond the bank indicates how frequently the meadows are laid under water by the rising of the Thames, notwithstanding the palisading, or campsiding as it is locally called, which gives artificial height to the banks. There is every reason to think that the present boundaries of the Thames, throughout the greater part of its course, are entirely artificial, and that the river was formerly much wider though doubtless also shallower and less navigable."